Category: E-Workbooks. Tags: Fundraising, Major Gifts, Solicitations. This practical workbook is based on the authors’ decades of experience soliciting charitable donations and training others to do the same. …this book is for you! We’ll walk you through a proven step-by-step process that can help anyone – really anyone – be successful at making personal asks. A 7-step guide, complete with checklists, that takes you through the personal solicitation process from start to finish. The Asking PathTM – a tried and true method for structuring the solicitation meeting. Ready-to-use templates and tools to organize your work. Real-life tips and examples to help you visualize what to do and how to do it. 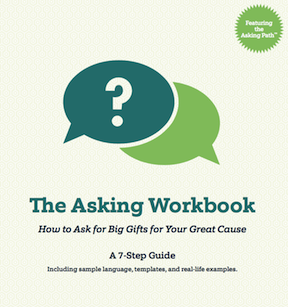 The Asking Workbook is a simple workbook that provides a step by step approach to securing major gifts. Professional fundraisers, as well as volunteers, will benefit from reading it and implementing the Asking Path. The workbook provides concrete steps to follow to identify prospects, establish a goal and a strategy, cultivate the prospect, prepare for the ask and making the ask. It offers checklists, templates, tools, and practical suggestions for all of the steps involved in securing a gift. The real-life examples found throughout the workbook are excellent. You have a coach to guide you through every step of the process. After reading the workbook you are sure to have more confidence in asking for gifts and knowing how to respond to what happens at the meeting when the ask is done. I highly recommend The Asking Workbook.